The glorious history of Thailand dates back to thousands of years but still the intriguing evidence of its faded civilizations is never far from the view. 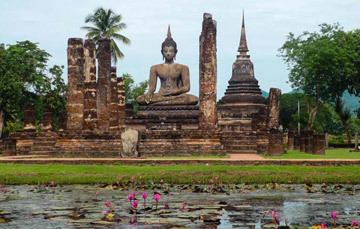 The fascinating national treasures of the ancient Thai kingdom are extraordinarily restored ruins that dot the country. They are an excellent source of historical knowledge that is carried over from generations to generations. The past of Thailand can explore via the ruins which the country has restored to preserve its history. One can comprehend the glory of its past while uncovering the classic architecture and artistic styles via the heritage structures of the country. The complex customs and beliefs of these distant civilizations is another way which helps to learn its past. No text books can provide the answers to these questions like how these civilizations flourished and what brought about their eventual downfalls. Therefore, one needs to explore the perfectly maintained on-site museums and the remarkable UNESCO World Heritage Sites of Ayutthaya and Sukhothai in order to comprehend its precedent times with a clear perspective. The edifices and monuments reflecting the country’s past are centered round Buddhist architecture. The atmospheric and deserted ruins on this land exude tranquility and spirituality which is rarely found in the contemporary life. These fascinating reminders of a glorious past like the ancient temples whose spires seems to pierce the horizon are exotically fringed by manicured lawns. Other such reminders stand under the shield of the monumental Buddha statues with their chiseled weathered features. If we look closely at Thailand’s Golden Age we will get know that the northern city of Sukhothai was the first capital of this country. This was the golden period of innovation which was reflected in the architecture and religious imagery of the place. The history of this city reaches back to the 13th century. During the time, the construction of temples and palaces were unique. They were combined with extensive compounds and were splendidly decorated by ponds and moats. These edifices now stand as amazing heritage. One can explore these sites by walking tours or with bicycle tours. Another city which contributes largely in the history of Thai Kingdom is Ayutthaya. It was the most important regional trading centre for over four centuries. The setting of this historic city is dominated by rivers and canals. 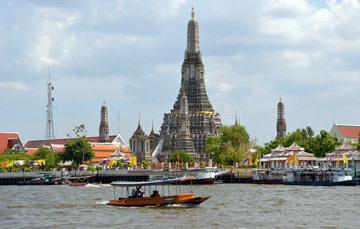 While exploring the city one can enjoy cruising aboard a small long-tail boat. The prime city of the present Thailand - Bangkok - was found in 1782. It does not stand as a historic city but it does have significant prominence which contributes in the past of the country. The city boasts about 400 magnificent temples and several functioning palaces. The prime attraction of this prime city is the centerpiece Grand Palace and the Temple of the Emerald Buddha which are located close to the banks of the Chao Phraya River.